So to start this review of Black Star Double Hopped Golden Lager, I want everyone to take a look up top at the information on this beer. See that? See something that doesn't quite add up? Are you thoroughly confused? This beer is touted as being "double hopped," yet it's a pansy 15 IBU's. When I bought this tall boy, I didn't realize it was only 15 IBU's, after all, it says "double hopped" which would lead any logical person to believe it was ya' know... hoppy. I don't know what this reported double hop business is all about, but I was expecting something verging on being an IPA and was sorely let down. I may have even cried a little. 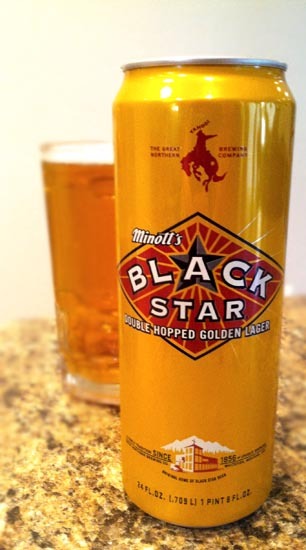 Black Star Double Hopped Golden Lager pours just like the name touts, a crystal clear golden color. It has a thin, quickly dissipating head and smells of caramel malt. Tasting is pretty unexciting: more caramel and mild malts, wheat bread, and just a subtle hint of hops followed by a short finish. To say this is not what I was expecting is an understatement. This is dreadfully boring. It tastes a lot like a homebrewed Budweiser clone I had once. It's like Budweiser with a little more flavor and a little more body. Nothing exciting. Nothing interesting, unless of course you find the fact that they tout this as being double hopped yet it's only 15 IBU's as interesting. Oh well... they can't all be amazing beers. Drink This: if your only options are Budweiser and this. Don't Drink This: if you're thinking the "double hopped" name means it will be hoppy! Because it's not! Don't be fooled!